AACSB International’s new BSQ Finances Module has enabled us to gather unprecedented amounts of data on governance models at business schools across the world. Since my previous post covered their relationship with their parent institution, if any, and aspects of governance have been covered in our most recent eNEWSLINE, today I’ll discuss the levels of autonomous control that our respondent schools enjoy over various organizational functions of the business school. As you can see, there are a lot of data to be teased out here. Just a couple observations I thought were interesting: Firstly, student residential centers were (perhaps understandably) the most likely to be under the control of an entity other than the business school, but I thought it interesting that this was the case regardless of relationship type. Secondly, I was intrigued by the functions that were less likely to be present at all. 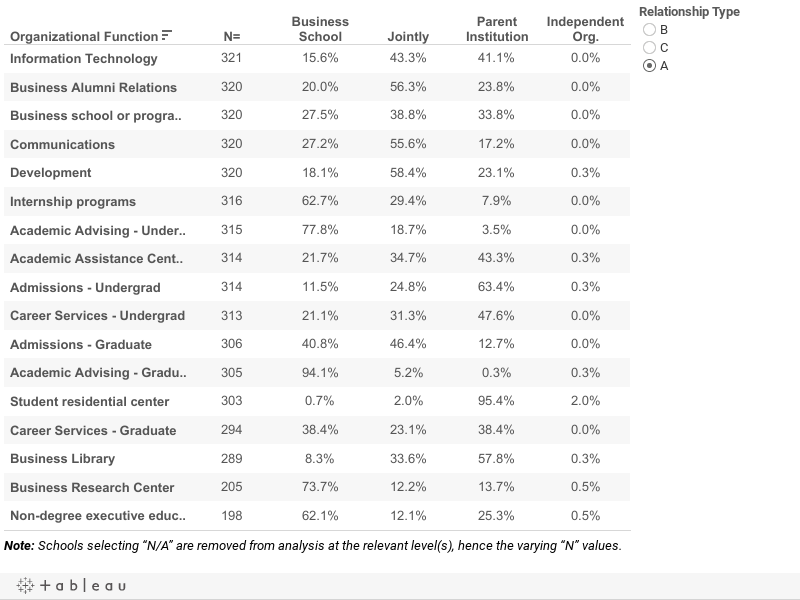 If you look at the numbers of respondents reporting the functions at their school, you can see that there are far fewer business schools where non-degree executive education centers or even research centers are reportedly present, relative to some of the other functions that almost every school reported on, such as information technology. What observations do you make? What do MD and MBA programs have in common? Increasingly, it seems, their students! At first this came as a surprise to me, especially when I look back at my own college experience and remember how the two departments, and even the students, seemed so distinct from one another. But perhaps you, like me, have come across some of the numerous articles that have appeared recently about doctors pursuing an MBA degree, and the growing popularity of MD/MBA joint delivery programs. Is there truth behind the trends they’re reporting? According to AACSB International data, in 2004-2005 38 member business schools reported a healthcare emphasis in their MBA program, ranging from healthcare management, to pharmacy, to nursing. That number grew to 54 in the 2009-2010 academic year. 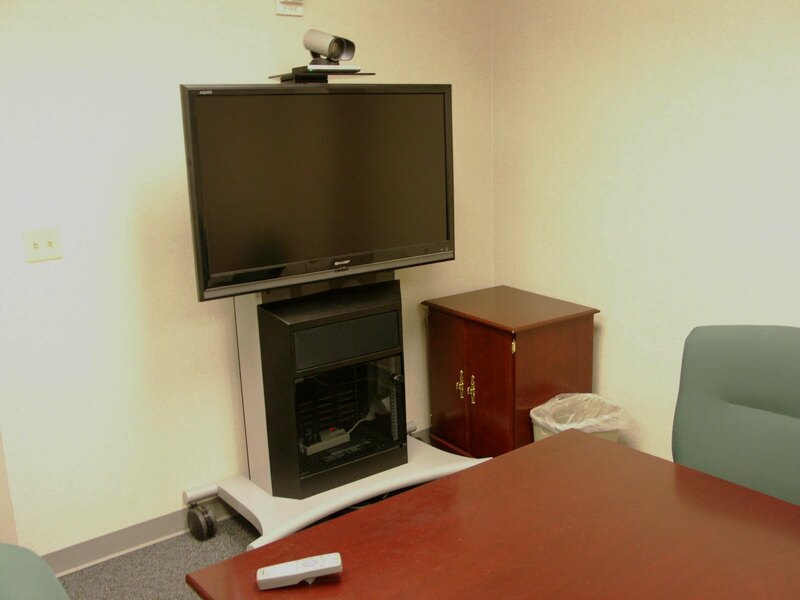 The Association of MD/MBA Programs maintains a number of schools offering joint MD/MBA programs. In that list, only two were non-U.S. institutions (Canada). When I conducted a Google search of my own for MD/MBA programs outside of the U.S., I found none. Time will tell if other parts of the world will follow, or remain immune to the MD/MBA bug. Possible reasons for new programs that link the two fields are more doctors viewing an MBA as an essential ingredient to improving their business acumen or the efficiency and productivity of their clinics and offices. After all, who hasn’t had at least one medical experience that consisted of long waits, appointment miscommunications, poor service and management, etc? It’s possible that incorporating more business skills into the medical field could help to relieve a whole different kind of headache. Some of Jerome Groopman’s theories expressed in his book, “How Doctors Think,” may also hold true as another reason for this new trend. In a HBR review by Larry Prusak, both doctors and managers are questioned on their people skills; for doctors it’s the relationship with the patient and for managers it’s the relationship with the employee. Both professions face the risk of depending too much on procedure instead of “really thinking” and “participating.” According to Groopman and others, managers and doctors have much more in common, in terms of making a successful career, than what many would think. The recent Oscar winning documentary, “Inside Job,” along with media coverage of the irresponsible side of business have not helped boost management education’s image. Hollywood has used this as a popular theme in films throughout the years, particularly in the 1987 film, “Wall Street” and its recent 2010 sequel which focuses heavily on the reckless behavior, e.g. insider trading, of business executives that eventually led to the economic crisis. The main character of the film, Gordon Gekko, has become the archetype of the ruthless, profit-driven businessman, worried only about his own self-interest with no regard to social responsibility. Even though the film came out when many of today’s MBAs were mumbling their first words, it is difficult to find a student pursuing his or her business or MBA degree who does not know what this character embodies or who he is. However, contrary to the dominant media message, my work at AACSB suggests substantial interest, innovation, and investment in the area of business ethics. I’m the newest member of the AACSB research team and was pleasantly surprised to learn about the amount and quality of good work by business schools in this area. Unfortunately, their work has been easy to miss since it lies deep below the surface. It doesn’t make the news reel or help bloggers to attract comments, likes, and retweets. It is an inside job. For example, our own surveys help us to count the number of schools that have a major or concentration in ethics, social/environmental responsibility, sustainability, or non-profit management. That number has risen. But these data do not capture the much larger number of schools and programs that have expanded the role of ethics throughout the curriculum. Nor do they show the rise in the proportion of programs requiring courses in ethics; a number the Aspen Institute Center for Business Education, Beyond Grey Pinstripes reports has increased from 34% in 2001 to 69% in 2009 amongst schools responding to their surveys. The emphasis on ethics is definitely growing, and that suggests business schools have been taking serious action to promote ethical and responsible behavior among their students. AACSB accreditation standards have long mandated that ethics be a part of the business curriculum. A growing number of business schools are incorporating a socially responsible mindset into their school’s culture through curriculum revisions, projects, and course requirements, even at the undergraduate level. For example, a recent AACSB Ethics and Sustainability Spotlight highlights the Building Ethical Leaders Using Integrated Ethics Framework (BELIEF) program at Northern Illinois University, where undergraduate business students are exposed to various methods and tools to help them become more ethical decision makers; students must even pass an online test covering the contents of an ethics handbook in order to register for subsequent courses. Another example of business students displaying “do-good” behavior, practices, and ambitions is found among participants in the Foundations of Management and Entrepreneurship (FME) program at Babson College, where freshman year students learn social responsibility and business acumen in addition to the basic business disciplines (accounting, finance, marketing, and management). Student teams invent, develop, launch, manage, and liquidate a business, while also volunteering for a non-profit organization throughout their spring semester. At the end of the semester each team donates its profits to that organization. An abundance of tools for incorporating ethics into the curriculum have become more available to business schools. AACSB’s Ethics and Sustainability Resource Center Tools page provides links to many, such as CasePlace.org, which is organized by the Aspen Institute Center of Business Education and provides teaching materials (free of charge) to business school faculty (as well as other faculty, students, and professionals). Members can exchange ideas and materials, comment, and add content. Another similar noteworthy initiative is the Giving Voice to Values curriculum, which “helps students identify the many ways to voice their values in the workplace. It provides the opportunity to script and practice in front of peers, equipping future business leaders not only to know what is right, but how to make it happen.” And, it is also free to faculty! As it is inevitable that instances of corrupt behavior will arise among some business leaders, even MBA graduates, for the most part business schools have shown responsibility in addressing ethics. Whether in joining initiatives like the Principles for Responsible Management Education (PRME) that inspires and champions responsible management education, research, and thought leadership globally, or urging recent business graduates to maintain social respect and responsibility in their work and personal lives (recently reported in Bloomberg Businessweek), business schools have worked hard to steer students in the right direction. It is well known that business is a popular field of study. The figure below recreates a chart published by UNESCO in 2009 using 2007 data (more recent data is not yet publically available). It shows that 17% of "local" tertiary-level students studied "business and administration." That's more local students than any other field. More interestingly, the proportion studying business and administration jumps to 23% for internationally mobile students (those studying abroad for a year or more). Again business claims more internationally mobile students than any other field, but we also see that these students are even more likely to study business than local students. Why? I usually suggest three explanations. The first, and most obvious, comes from the relationship between the subject and students. Students who intend to study abroad have preferences that also make them more likely to study business. In my experience, both business and internationally mobile students tend to be curious, ambitious, and assertive, and perhaps relatively less averse to risk. Since business is increasingly a cross-border activity, it is more likely to capture the interest of international students. In contrast, primary and secondary level teachers, for example, would expect more of their careers to be centered in their home country. So, education as an area of study is a more popular subject among local students than international students. I should be careful to note that international education is also important because business is not entirely global. Management practice is still very much context specific, while approaches in some subjects, such as mathematics and sciences, may be more universal. As long as cross-border differences matter in business, we should expect international study and business education to intersect. The second reason has more to do with the actions of schools. Compared to many academic and professional departments, business schools have been more proactive in recruiting international students. Business schools are also thought to be more entrepreneurial and independent than other academic units. In the Great Brain Race (p. 120) Ben Wildavsky wrote that business schools "were early adapters to globalization," while in a recent article the Economist goes too far, stating that "in the past decade business education has globalised more thoroughly than business itself." The main point here is that many business schools have sought to diversify student populations to enhance international learning, build global reputations, and increase revenue to advance their missions. Finally, I cautiously explain that perceived international differences in quality also may be a factor, though its importance appears to be diminishing. Many students choose to study outside of their home country because they are seeking what they believe is a higher quality education. Larger perceived international differences in quality among providers might be associated with higher proportions of internationally mobile students in some fields. According to UNESCO in 2007 the top two sending countries were China and India, where business education is relatively new, and the top two host countries were the United States and United Kingdom, where business education is more mature. However, there is emerging evidence that prospective students, especially for graduate management education, are finding what they want at home.